The state of Montana offers some of the best fishing opportunities in the world. It is a fishing paradise set in a land of spectacular, natural beauty. 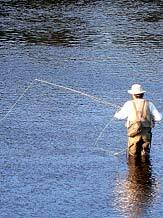 Find excellent fishing for trout, salmon, bass, walleye, crappie and more. We focus here on the major lakes in Montana. Additionally you may also find excellent fishing on smaller lakes, ponds and streams. Some of the best fishing rivers in MT include the Madison River, Gallatin River, Yellowstone River, Boulder River, The Missouri River, Stillwater River and many, many more. Here in the great outdoors of Montana, you can fish for largemouth bass, smallmouth bass, channel catfish, black crappie, white crappie, walleye, rainbow trout, cutthroat trout, brook trout, brown trout, lake trout, golden trout, bluegill, green sunfish, pumpkinseed sunfish, rock bass, white bass, yellow perch, coho salmon, kokanee salmon, northern pike, paddlefish, sauger, saugeye and tiger muskie in local lakes, rivers, ponds and/or streams. This chart shows the major fishing waters in Montana, cross referencing these waters with the major types of fishing to be found in each of the lakes or impoundments. For a more complete list of fish species in Montana, see the list below, which also includes state records. Ashley Lake is a 3,200-acre lake in the northwest part of the state, 8 miles west of Kalispell, MT. Bighorn Lake is a 5,570-acre lake, located in the south-central part of the state, in the Bighorn Canyon National Recreation Area. Bull Lake is a 1,200-acre lake in the northwest part of the state, 10 miles south of Troy, MT. Canyon Ferry Lake is a 33,500-acre lake located in the west-central part of the state, at Townsend, MT. Clark Canyon Reservoir is a 4,800-acre lake in the southwest corner of the state, 15 miles south of Dillon, MT. Deadmans Basin Reservoir is a 2,000-acre lake in the west-central part of the state, at Shawmut, MT. Flathead Lake is a 128,000-acre lake in the northwest part of the state, at Polson, MT. Fort Peck Lake is a 250,000-acre lake in the northeast part of the state, at Fort Peck, MT. Fresno Reservoir is a 3,200-acre lake in the north-central part of the state, 3 miles northeast of Kremlin, MT. Georgetown Lake is a 2,800-acre lake in the west-central part of the state, 12 miles west of Anaconda, MT. Gibson Reservoir is a 1,300-acre lake in the central part of the state, 15 miles northwest of Augusta, MT. Hauser Lake is a 3,200-acre lake in the west-central part of the state, on the northeast outskirts of Helena, MT. Hebgen Lake is a 11,000-acre lake in the southeast corner of the state, 3 miles north of West Yellowstone, MT. Holter Reservoir is a 4,800-acre lake in the west-central part of the state, at Wolf Creek, MT. Hungry Horse Reservoir is a 23,500-acre lake located in the northwest part of the state, 5 miles east of Columbia Falls, MT. Lake Frances is a 3,600-acre lake in the northwest part of the state, at Valier, MT. Lake Helena is a 2,100-acre lake in the west-central part of the state, on the northeast outskirts of Helena, MT. 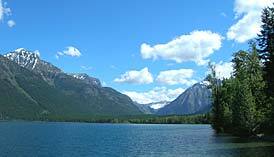 Lake Koocanusa is a 28,800-acre lake in the northwest corner of the state, at Rexford, MT. Lower Saint Mary Lake is a 3,900-acre lake in the northwest part of the state, 5 miles south of Babb, MT. McDonald Lake is a 6,800-acre lake in the northwest part of the state, at West Glacier, MT. Nelson Reservoir is a 4,100-acre lake in the north-central part of the state, 8 miles west of Saco, MT. Noxon Reservoir is a 6,100-acre lake in the west-center part of the state, at Trout Creek, MT. Placid Lake is a 1,200-acre lake in the west-central part of the state, at Placid Lake State Park, MT. Seeley Lake is a 1,000-acre lake in the west-central part of the state, at Seeley Lake, MT. Tiber Reservoir, aka Lake Elwell,is a 14,800-acre lake in the northwest part of the state, 5 miles south of Galata, MT. Whitefish Lake is a 3,300-acre lake in the northwest part of the state, at Whitefish, MT. Willow Creek Reservoir is a 1,300-acre lake in the west-central part of the state, at Augusta, MT. Visit AA-Boats-Boating.com to find information about fishing boats in Montana. Click here to obtain a Montana Fishing License. 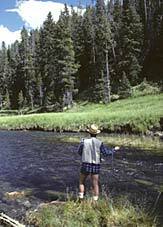 For more information about fishing in Montana, visit the Montana Fish, Wildlife & Parks website. Excellent largemouth and smallmouth bass fishing opportunities are available to anglers in MT.